The Pointe-au-Chien Indian Community is located in Terrebonne and Lafourche Parishes. 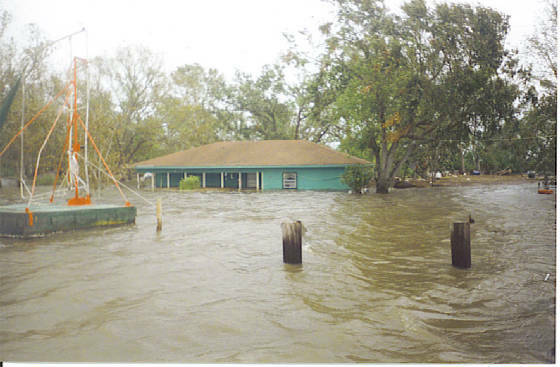 The tribal community was impacted by Hurricane Katrina but suffered a 9-foot storm surge from Hurricane Rita. The Community inhabits its traditional land base. 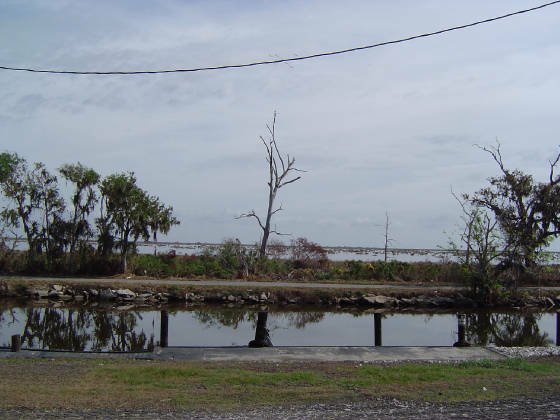 This land base has diminished significantly over the years because of salt water intrusion resulting from the channelization of the Mississippi and the loss of barrier islands. This has been further enhanced by the intense cutting of the land by industries seeking natural resources. The Tribe fears that the small remaining land base will soon be gobbled up to the elements and important sacred sites, including burial grounds, will be destroyed. The Hurricanes not only impacted the homes of tribal members but the economic base for tribal members. Most tribal members engage in traditional subsistence rely on the crab, shrimp, and/or oyster industry for income. Hurricane system interrupted this economic generator and has resulted in an income loss that usually sees tribal members through the winter. The Pointe-au-Chien Indian Community is not protected by a levee system. It is unclear when a levee system will be in place. Ironically, the nonIndian communities to the east and west of Pointe-au-Chien are included in a levee. Progress on levee plans for the Pointe-au-Chien area is slow, and the current plans do not include all of Pointe-au-Chien land nor does it include our sacred sites or burial grounds. Tribal homes have been devastated. Although homes are in uninhabitable conditions due to the hurricane damage, few FEMA trailers were provided to tribal members. Those trailers were available until a few months after the storm. After Hurricane Rita, aome members gutted the walls, exposing them to harsher conditions as the temperature drops along the bayou during the winter. Others were living in homes that had not yet been gutted, exposing the homes to increased mold infestation. To date, not all homes have been repaired or restroed to pre-2005 hurricane conditions. Most of the assistance to the Tribe and tribal members was provided by the Mennonites, non-profit organizations including National Relief Charities and the Four Directions Relief Project and our friends in France. Tribal Chairman Charles Verdin and tribal members Monique Verdin and Patty Ferguson were active in rebuilding efforts. Second Chairman Donald Dardar, Theresa Dardar, and Bernice Billiot organized relief materials to tribal members. Other tribal members volunteered time to relief work include Gertie Verdin, Theresa Billiot, Donald Billiot, Basile Dardar, and many many more. To help respond to the 2005 hurricane season and to plan for future disasters, the Tribe created a relief committee. Because the Tribal community is small, the Tribe worked with the Biloxi-Chitimacha Confederation of Muskogees to create the Louisiana Coastal Tribes Coalition to work together on matters such as responding to natural disasters. As a result of this coalition, an elderly couple in Pointe-au-Chien and another family in Pointe-au-Chien received new homes through a collaborative project with the Mennonite Disaster Services. Any questions regarding relief can be sent to verdin1504@yahoo.com or ferguson@sackstierney.com. Read about the first home being built in Pointe-au-Chien after the 2005 Hurricane Season. November 29, 2006 Press Release.